Two vodkas in a row? Well yes, actually. It’s not because we just happen to be on a vodka kick (we are, as it’s warming up here). It’s actually because the past two liquors (Van Gogh and now Zodiac this week) were gifts from friends. They caught wind of our new format and seemed happy to jump on board. Zodiac was introduced to us by the owner of Cocktails, 365’s liquor supplier. She happened across it during a trade show, tasted it and pick up some on her own dime to have us try. Zodiac is an 80 proof potato vodka that hails from Idaho — the heart of potato country. The company’s website pushes its hand-made status in an attempt to distance itself from the widely produced “factory” vodkas that some people tend to drink. In the manufacture of anything, what you begin with has a lot to do with what you end up with. Zodiac is then blended with pure Rocky Mountain spring water drawn from a deep well in the plains of the Snake River and carefully filtered through hand cut Canadian Birch Charcoal. Zodiac is made from beginning to end entirely in Idaho, and under the strictest of quality standards. The end result is an incredibly smooth, unique tasting vodka. Very clean and crisp. Not heavy grain scents that you can catch on some other vodkas. Nice bit of bite, but a clean finish with no lingering after taste. 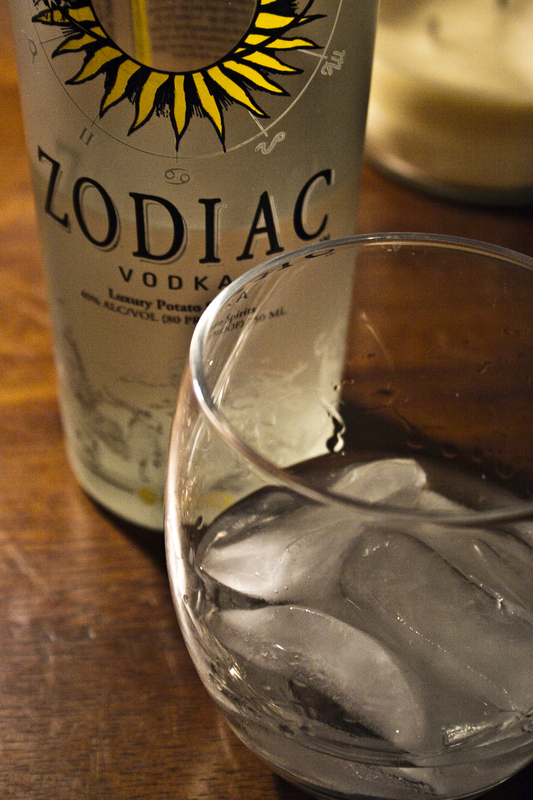 If the goal of vodka to have a neutral taste, then Zodiac fits that bill perfectly. It disappears off the tongue while having enough “oomph” that you are aware there’s some liquor there. Tomorrow: guest cocktail from website reader Don Steele; Pepper Bloody Mary.